Find Out How Much Candy You Can Eat After Every Run! The leaves are bursting into color and there is a cool ‘nip’ in the air. It is the month for spooky movies, outrageous costume parties, and candy galore. Halloween season is upon us! Prepare yourself for a non-stop food extravaganza over the coming weeks. This is just the first of many back-to-back holidays that are sure to make your jeans feel tighter. Guard yourself from the luscious combination of peanut butter with chocolate, sugary chews, and baked treats ready to bombard your waistline. But alas…isn’t there something you could do to avoid the horrible holiday weight gain? Isn’t there some way to ensure your ‘Sassy Nurse’ costume grabs that handsome Frankenstein’s eye across the room? How can you put a little extra hop in your fuzzy bunny disguise? We’ve got the answer for you in our Halloween Runner’s Menu! Before you go raiding your children’s trick-or-treat candy stash, we’ve come up with this handy runner’s guide to Halloween. Find the closest weight along the left hand side that corresponds to your own body. 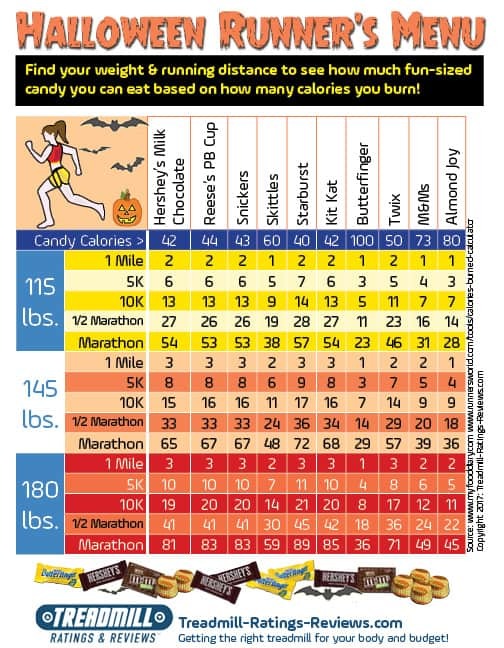 Then, check out your favorite running distance to see how many guilt free candies you can scarf down after your outing. Double, double toil and trouble…butterfingers crunch… cauldrons bubble! Enjoy your run AND your candy.